I’m not much for fancy dinners, perhaps because I’m a woman of the people, or, more likely, because I can’t afford to eat them. Contrary to what some may have you believe, I’m not invited to eat for free in trendy restaurants on a regular basis. Or at all. Ever. Once, I was invited to review a burger joint I already frequented. And I paid. That’s the sum total of my invitations to restaurants. When other food bloggers say if they didn’t eat on the house, they’d never get to blog a high class place, I have literally no idea what they’re talking about. Oh, for the luxury of agonising over the ethics of disclosure. So when I heard that this year’s Eat. Drink. Blog. food blogger’s conference included a fancy dinner at a place I’d heard of, I was in. I’m not ashamed to say this was the fanciest dinner I’d ever had. I’m also not ashamed to admit I almost walked past the restaurant the first time around. I arrived at 7:55pm as dinner was to start at 8, and was informed I’d missed the appetisers. No idea what they were but I’m sure they were delicious. I plonked myself down next to my lovely co-bloggers and we were given a rundown of the menu, which was impossible to hear over the general merriment that inevitably accompanies a $134.90 wagyu rib on the bone or a crustacean so large, it requires not so much a bib as a full length plastic apron. A glass of Reisling soon calmed my nerves and a spotlessly attired waiter informed us the entrees would be out soon. Servers laden with plates soon appeared and carefully placed our plates. What greeted us was not so much a meal as a landscape. Smoked yellow fin tuna carpaccio, swirled around some mayonnaise or equivalent, studded with micro herbs, pickled chillis and a smattering of pistachios. Cameras came out in a flash (pun completely intended) and a waitress appeared out of nowhere to inform us that a special, professionally lit table had been set up in the corner should we want to photograph each dish in a more flattering light. Many of my co-bloggers kept on snapping away, even requesting used wine bottles to set up an enticing tablescape. I, however took my first bite of carpaccio and it was amazing – silky, smooth, not in any way fishy, and with a texture my mouth couldn’t quite make sense of. The mayo-like-substance it sat on was slightly sharp and very creamy, and the pickled chillis, the most remarked upon feature of the dish, exploded in indescribable bursts of vinegary sweetness. As I finished the dish, all the flavours started to meld together and I became conscious only of the dishes textural contrasts. I loved it. 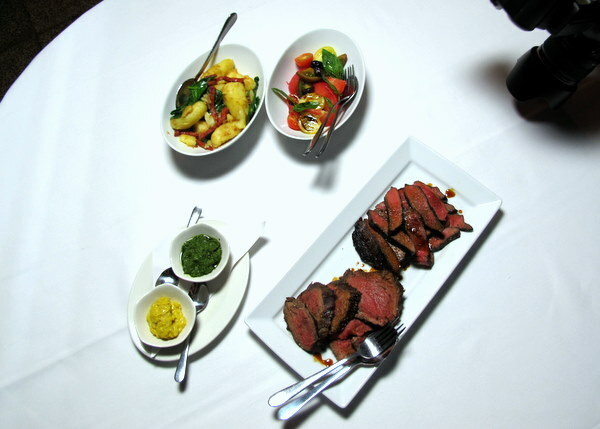 The second course of slow roasted beef tenderloin and wagyu flat iron steak was sliced up on platters to share. We also had kipfler potatos with chorizo and spinch (unexciting), grilled asparagus (tasty) heirloom tomato salad with basil and roast olives (to die for) and a cast of condiments. This was washed down with a nice glass of shiraz. I have to talk about the flat iron steak here. Sure, I slathered it with chimichurri but I needn’t have done, it was amazing. It had a lovely charred crust on the outside, was tender and juicy on the inside. One of the best steaks I’ve had outside of Argentina, although that gives you no indication of quality whatsoever so I’ll say this instead; it was quite good. The final course was a cheese course of sweet gorgonzola, which was a welcome end to a day spent stuffing ourselves with pastries, chocolate and macarons. 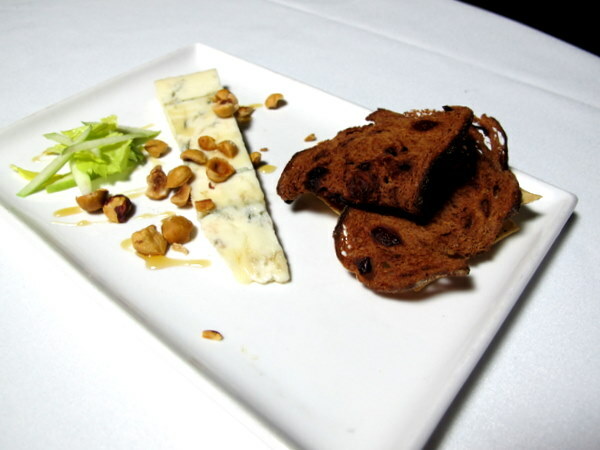 The mild blue cheese was sprinkled with toasted hazelnuts and drizzled with iron bark honey. This was perfectly offset with a glass of St Hallett Rose from the Barossa Valley. I got into the habit of getting up each time a new plate we placed in front of me, ducking over to the ‘display table’ and snapping away. This seemed an efficient use of time as I was unable to begin eating until my dining companions had finished their photography. Every time I returned, my napkin was neatly folded by my plate and my water glass refilled. I can’t fault the service, I can’t fault the food, I can’t fault the price (free). All in all, a great night. What about you? Are you much of a fancy dinner person? … now, where’s my camera? Fancy dinners always intimidate me, maybe cause I don’t usually do them with 2 kids in tow, lol. But on those rare occasions I have done them, I loved the experience. The food looks amazing Lau! A pity I missed out for a snags and salad barbecue! Well, i’m all about dinners out, fancy or otherwise. And I like how you’ve written about this one. But the words that really fill me with envy are, “one of the best steaks i’ve had outside of Argentina”. I am dying to go to Argentina, and pretty much just for the beef! You have to tell me all about it. Differences in cooking aside, Argentine steak is largely grass fed, and better aged. As was Australian beef before consumer demand from urban areas was for “young” beef, in preference to aged, flavoured & tenderised meat. I’ll take my beef 7 years old, preferably a British breed, that has fattened quickly after a long drought, then hung in a coldroom for several weeks after slaughter, until the meat begins to turn green. THEN cook it on an open hotplate (or the Argentine way – which for all the world looks like “fresh smoking” of meat) either way, it’ll melt in your mouth. Whoever taught the Australian consumer that meat has to be young to be tender, well they ought to be shot. I agree Argentina definitely know’s what it’s doing when it comes to beef. I always thought it had to do with their cattle roaming free on the pampas, I never knew that there was an aging aspect to it as well. I’ll take your tips and add the one thing I do know about cooking steak – do like the Brazillians do with their picanhas – salt it well. I’ve seen them do the same in Argentina, coating the larger cuts with rock salt before cooking. Er… I am most definitely not a food blogger. Notwithstanding that a recent post of mine was mostly about food. The breeding & raising of beef in Australia is done in circumstances that should be well known. Alas there has been little critical thinking by reporters & those who write about beef production or meat. This is not helped by these scribes seeming to have little understanding or interest in the product while it still had hair on. (pre-slaughter, if you like). Historically most of what one reads about beef has been from the USA, or based upon research/studies done in the USA. So much is different there, they don’t even manufacture barbeques the same way (they make them with a cover, would you believe? ), never mind cook meat in a fashion that remotely resembles how it has been done here. It has been a lifelong frustration to see misinformation about beef in Australia. The pork & poultry producers are not innocent in this. I’m not for ONE SECOND suggesting they have been up to no good, but it is certainly parallel to their interests for red meat to be smeared, in the manner that it has been for 30 years or more, smeared to journalists, publicists & to the general public. Every day it becomes less relevant, as the grain feeding in feedlots, & killing of younger cattle, brings Australian butcher shop beef slowly into line with what the public perception of it has been for 30 years or so. I don’t eat out that much because I like to cook so I generally eat in. I do enjoy the occasional fancy dinner as I get to eat food that I wouldn’t normally cook at home. Blue Apocalypse recently posted…Ayutthaya. Eating Street Food. It was a great meal, wasn’t it! The last time I was in Wooloomooloo, we went to the Indian restaurant right on the corner (also great food). We walked in and half of the MasterChef season 3 guys were there – Adam, Jimmy, Courtney, Callum, Matthew! Pretty cool! I love fancy dinners, we save up to go somewhere special every now and then, and I always look around me in the restaurant and wonder if the other diners go there all the time! Michelle recently posted…Welcome to Sydney Jamie! Schmancy dinners are infrequent – maybe two or three per year. Though it’s hard to drive past Lochiel House in Kurrajong without stopping. We have an anniversary dinner at Marque booked for later this year. Quite excited for that one. Amazing photos, I was wondering if you had a new camera until I read about the pro lighting deal. Food looks great and I love the idea of finishing dinner with cheese. My parents and grandparents are really into fancy dinners, so I’ve grown up going to them. However, when it’s up to me I usually prefer more casual places, both for the cost and the atmosphere aspect. I’m a bit intrigued by this post, as I recently went to a Kingsley’s here in Canberra. I wonder if it’s a chain then?! Apparently they’re a chain, although I’m sure in fine dining circles they’re probably not called chains. That’s what I’m going to call them, anyway. Oh that carpaccio was the bomb!! I’ve been craving another just as good… but I am with you.. I’m not for fancy dinners either, I find they can be over-priced and very disappointing.. give me a funky and fresh cafe anyday ! !